Alternative Perspectives | It’s time to be impatient; it’s time to take charge! It’s time to be impatient; it’s time to take charge! How many degrees does the mercury need to rise, before we act on climate change? How many COPs1 must we wait for climate action, before we realise that it’s up to you and me? The answer my friend, is blowin’ in the wind; the answer is blowin’ in the wind! Yes, the answer is blowin’ in the wind! It is blowin’ in the wind, and in the typhoons tearing through Philippines and hurricanes marauding America, gushing in the flood waters inundating Pakistan and India, crackling in the forest fires ravaging Australia. But can we hear it? Or have we been lulled into a stupor by the empty promises and half measures by our so called leaders? It’s time we woke up to the answer – we can wait no longer, it’s our turn to lead! “It’s Our Turn To Lead”, the rallying cry of Earth Day 2015! But why is it our turn to lead? Why is the onus of action on us? The answer stares us in the face; because our leaders have failed us. But we cannot fail our planet, it is the only one we have! You and me, the common people have to take action because we will be the ones to bear the brunt of climate change. Yes, we, the youth who have witnessed climate impacts accelerate at an unprecedented pace in our lifetimes, the women in the village who have to trudge the extra mile to get water for drinking as the wells dry up, the farmer who is contemplating suicide after his crops have failed due to delayed monsoon. And we seem to be up to the challenge; common people across the world are already taking action at their own level. 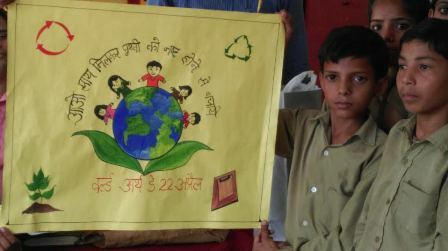 We have only to take a look at the Earth Day celebrations across the country, not just in the cities but across villages that speak of a resurgent civil society taking charge of its future. 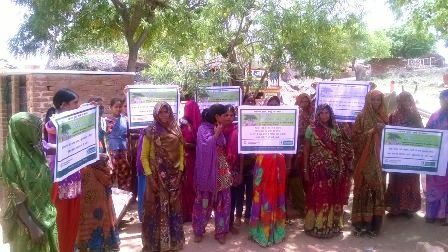 In Bundelkhand, more than 500 youth and women from 20 villages in Madhya Pradesh and Uttar Pradesh came together to celebrate Earth Day 2015 to recognise and renew the ties that bind us to the Earth in a common future. They pledged environmental action and rallied for change. But these voices need to be heard from every corner of the world, need to build up into a clamour for climate action by our leaders that they can no longer ignore. As common people across the world have come together to observe Earth Day 2015, let us all renew our pledge to protect the planet that we call home. It’s our turn to lead, and we will lead with climate action every day; every day a day for action, every day an Earth Day.